We adopted Charlie from a shelter. He was friendly, but didn't want to interact with us. At about 6 weeks a light spot triggered a non-stop obsession to chase and scratch at lights. He was very distressed and couldn't leave any light spot alone. Many people asked if we were going to give him back to the shelter, but we had made a commitment and determined that we would help him. 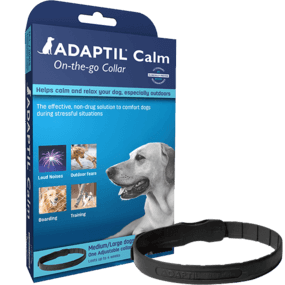 I searched for calming aids and found the ADAPTIL Calm collar one day at the store. I put it on him and he immediately calmed down. Although it didn't stop his issues, we worked with his Vet who was also an animal behaviorist to change his habits. The collar helped us to get him to relax enough to pay attention to us and learn to leave his obsessions behind. Although it took a while, Charlie is much better. Training him to redirect his energy in conjunction with the calming collars (which he still wears) has helped Charlie to calm down enough to learn to trust us, interact with the family and leave most light spots alone. I have recommended your product to many friends who have adopted shelter pets and they have had great results as well. Thank you!